Before the unification of Italy about 1861, Italy consisted of many small states, kingdoms, and duchies. This makes the period more interesting for historians and coin collectors alike. The Ligurian Republic was in existence from 1798 to 1805. 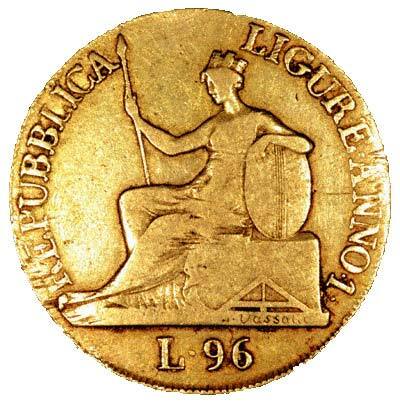 The coin denomination used by Liguria include zecchino, (plural zecchini), and lira (plural lire). The lira coins were denominated in amounts of 12, 24, 48, and 96. These values seem strange to us now because we are all used to the decimal system. According to Krause, the 48 lire coins were struck in .909 fine gold which strikes us as unusual, we would have expected them to be in 22 carat (.9166) as with the other three lire denominations. We have used the fineness quoted by Krause, as the editors may have greater knowledge than ours. 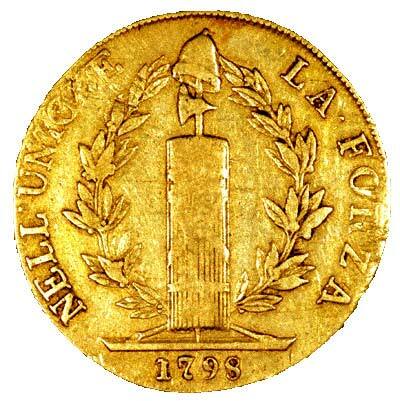 A seated personification of Liguria with the legend "REPUBBLICA LIGURIA ANNO 1" on the obverse, and a bundle of fasces, topped by an axe and a liberty cap surrounded by a laurel wreath, with the inscription "NELL UNIONE LA FORZA", with the date 1798 below, on the reverse.